Intimidated by a new way of eating? Wondering what you’re going to eat for the next month? Worried that you'll be living on nothing but salad and granola? Does digging through Google for unprocessed recipes sound tedious? Changing the way you think about food doesn't require much effort at all — if you've got a roadmap in front of you. We've created this simple meal plan guide just for you, so you can spend the next 30 days loving this new way of eating, without any stress. We've packed this digital download with over 50 simple, unintimidating recipes that all pass the kitchen test. That’s an entire month of knowing exactly what you’re going to eat, setting you up to make almost no in-the-moment decisions about food. For every purchase, we’re donating 10% to the Food Literacy Center, an incredible organization that teaches low-income kids how to cook and eat real food. 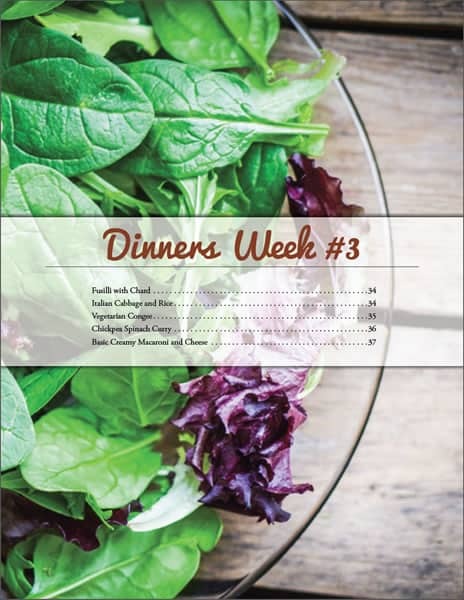 Four weeks of delicious, unprocessed dinner recipes, laid out in meal-plan fashion. Additional chapters packed with our very best breakfast, lunch, snack, and dessert recipes. More than 50 recipes to get you through the entire month of October feeling healthier than you have all year. 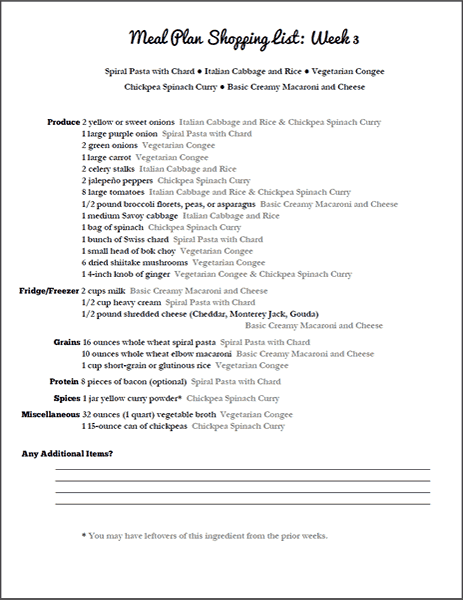 Added bonus: Four weeks of printable shopping lists for the dinner recipes, reducing your grocery store stress. Our goal is to make cooking as simple as possible, so most of the recipes in this guide can be made quickly, even by folks without serious cooking skills. These dishes are easy to prepare, with a few fun, aspirational recipes thrown in for the more adventurous. 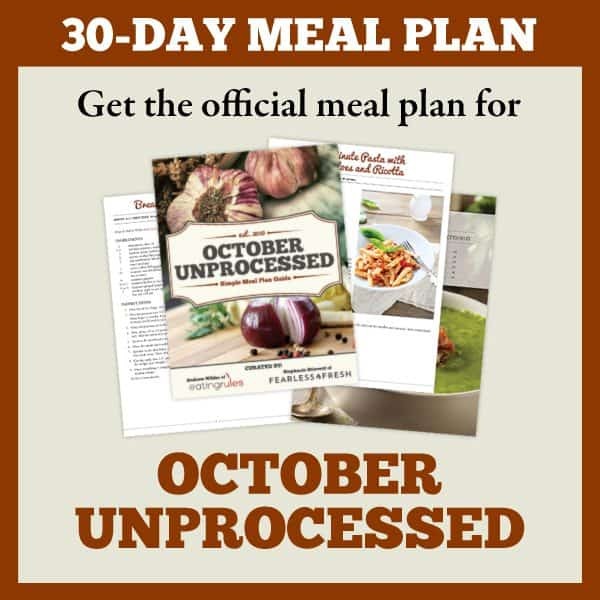 Basically, our promise is this: With this meal plan guide in hand, your 30-day challenge will go much smoother than if you had to go find a month’s worth of recipes on your own. Vegetarians, we’ve got your back. Most of the recipes in this book are vegetarian, and those that aren’t can be easily modified with our suggestions for how to make them completely meat-free. A note on food allergies: While the recipes in the guide were not designed specifically for those with food allergies, the bulk of the recipes can be modified with other ingredients. There are lots of folks in the October Unprocessed Facebook group who have a good understanding of these modifications, so we recommend popping in there to ask questions about how to adjust recipes for your specific diet. Paleo folks: Many of the recipes in the meal plan guide contain whole grains and a few other non-paleo ingredients, though they can still be modified with a little creativity. 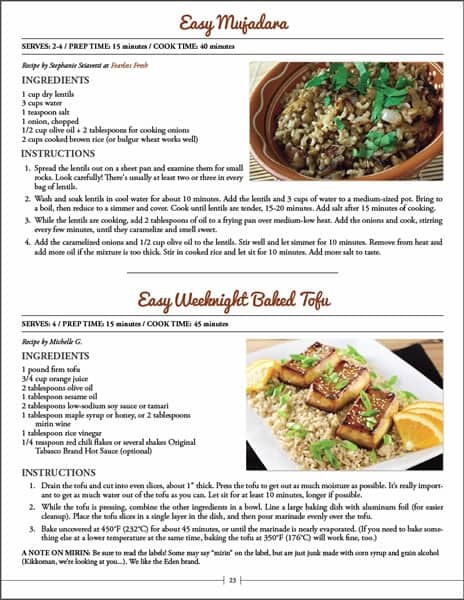 Have questions about recipes in the ebook? Hop into the October Unprocessed Facebook group. Have problems with your purchase? Email us at support@eatingrules.com.